It was a stupid idea, but then stupid ideas are all the Conservatives have. After Jeremy Corbyn’s overwhelming victory in the Labour Party leadership election, David Cameron – who, let’s remember, is the Prime Minister of the United Kingdom – stupidly tweeted that “The Labour Party is now a threat to our national security, our economic security and your family’s security”. The put-downs flew thick and fast – and This Blog has already mentioned some of them. But surely the hardest response came from the Russian Embassy, which gave a devastating criticism of Cameron’s behaviour while also reminding him that he has abandoned his responsibilities as PM. Mr Corbyn has hinted he would pursue warmer diplomatic relations between the UK and Russia. It is clear that the arrival of Mr Corbyn is pushing Cameron out into the cold. The only security threat Jeremy Corbyn poses is to that of Cameron’s job. If the pompous twit was a little more statesman like and a little less arrogant… any disdain he receives, which is long overdue, has been earned. Whether he even notices, in between his games of kick the peasant while he’s down and drone strike serial killer with the narcissist Obama, is quite another matter. I know this is off topic Mike but yay to Jeremy, for refusing to join in singing the national anthem!! What is the point of a neutered monarch, who will only ever know what she is told and doesn’t find out for herself? If she does know then she is as much a murderer as IDS is!! I cannot believe that she has absolutely No power whatsoever!! Just excuses!! This country Needs Jeremy Corbyn, at least he can embarrass the heck out of the slurry we have now trying to run the country!! The posh twit is already out in the cold, the cold war, which his handlers are desperate to reinstate. Mr. Corbyn didn’t get that memo of mass distraction it would appear. It’s interesting to watch how the establishment and their cronies become hysterical and apopleptic every time their obscene privileges and power over the minions and slaves are exposed and risk being challenged or heaven forfend, curtailed. This tweet has nothing to do with Russia, it’s just more of the same, thrashing around in the mud pit, throwing anything and everything in the hope something might stick. Of course the real, clear and all too present threat to UK citizens and their families security, as everyone here knows, is the bunch of gilded toffs, chancers, spivs, lackeys and scroungers currently in power. They’re quite literally a deadly menace to any UK citizen with the misfortune of having to rely on the state for sustainance, and what a twisted sickening irony that is. It’s a wonderful insight in to just how shallow and arrogant the chubby cheeked gilded glove puppet has become in his role as hedge funded delivery boy for the corporate takeover. After being elected by a media propaganda fed population of braindead slaves to the banking cabal and their wealth transfer pyramid scheme. 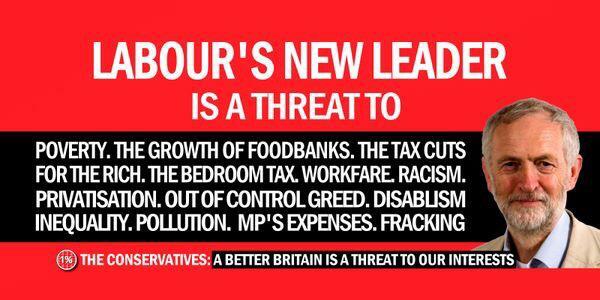 Greed and fear, a winning combination it would appear, and very well suited to the nasties. Well done David Cameron… Backfired on you this time didn’t it… You just look like an idiot! Cameron is a typical out of touch, pompous, arrogant, ignorant, classless, inbred, rich little posh boy who doesn’t know how to behave like a proper statesman, who cannot handle anything negative that comes his way. His reaction is that of a little private schoolboy who doesn’t know about reality and how life really works. Nice retort by Russia towards him for his petty minded response to Corbyn’s victory, Cameron once again left with egg all over his face! Great find yet again Mike!